The queen recently posted some pictures of herself and the Ooni waiting somewhere in the United Kingdom Instagram with the caption, #BaeWatch. Powerful Yoruba couple, Ooni of Ife, Oba Adeyeye Enitan Ogunwusi and his queen, Olori Wuraola Zynab Ogunwusi are in the news again. 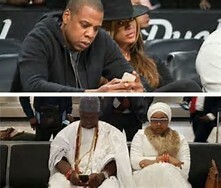 This time, the pretty Olori Wuraola was spotted giving the Ooni (and his mobile phone screen) some serious side eye on their most recent outing together in the United Kingdom. The queen recently posted some pictures of herself and the Ooni alongside their emissaries waiting somewhere in the United Kingdom Instagram with the caption, #BaeWatch. While the Ooni was spotted busy and seeming glued to his phone screen, Olori Wuraola took ample time of the day watching exactly what he was doing. The picture, posted by the Queen, shows her glaring at her hubby's phone from under the brim of her glasses. To crown her #BaeWatch mode, Olori Wuraola posted a picture of entertainment power couple, Jay Z and Beyonce with the songstress doing same to her hubby.